With the increase demand of higher resolution and more sophisticated touch control function on smartphone, the need of higher pin-count flexible cable from main system module to display panel has become one of the challenge especially in a compact form factor smartphone design. In view of such obstacle, Sony has developed a new technology that utilizes single coaxial cable wire with intention to replace current individual video, audio, control and even power signals based on time division and unique encoding mechanism. Typically, all the audio, video, control and especially the power signals are separated with dedicated cables cater for each in conventional system. And with the Sony’s newly announced technology, they have able to integrate them into a single cable with bi-directional transmission utilizing time division duplex and multiplex mechanism. In order to transmit both high speed data signals and DC power source over limited bandwidth, its proprietary encoding technology plays an important role with a transmission rate of around 940Mbps with distance of up to 60cm. 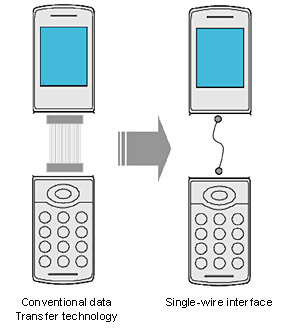 By having single cabling, the manufacturer will not only able to simplify its design in a space constraint form factor, but more importantly, it will able to improve design flexibility with high reliability especially in those sliding smartphone or flip-able clamshell designs which tend to deteriorate over time. Before the technology can be realized in actual end products, the Japanese company has partnered with ROHM Co. Ltd. for co-development and validation to ensure the technology can be adopted and scaled to different usage models.